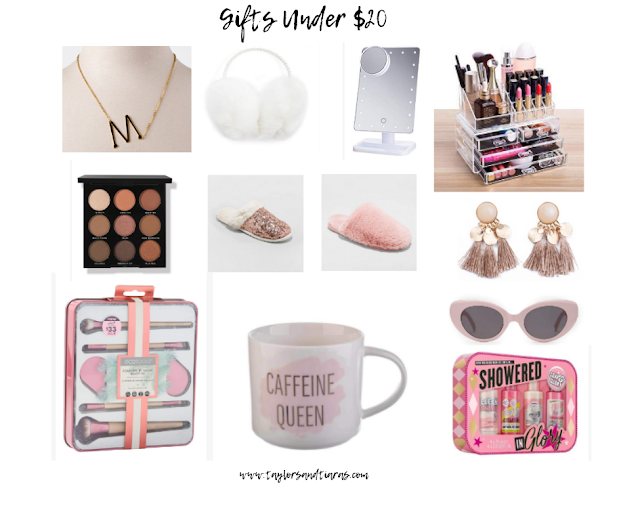 Taylors and Tiaras: Under $20 Gift Guide! It's the most wonderful expensive time of the year, y'all! I don't know about you, but every year I try very hard to stick to a budget when it comes to gift giving. Gifts are my love language and if I don't set a limit, I will absolutely go overboard. Can you relate? After announcing our pregnancy earlier this month (more about that in a later post!) and finally having more energy and less nausea, I wanted to dip my toes back into the world of blogging. I have missed it so much! So in true holiday spirit, I thought I would kick off the season with a gift guide. This isn't just any gift guide though - this is a huge selection of fabulous gifts for $20 OR LESS! Even on a small budget, you can still find gifts that will make someone smile, and that's what it's really all about. Ready to jump in? Let's go! I will be the first to admit, these gifts are pretty girly. In fact, if I'm being fully transparent, these are all gifts I would love to get, and some of them are things I already own. So, if you're trying to shop for someone who isn't into things that are slightly feminine and glam, this may not work for you. However, if you're shopping for someone who typically defines their favorite color as "glitter" then you've come to the right place. The best part is that several of these items are way below $20 which means depending on your spending limit, you could pair them up with a gift card and have a really sweet, beautiful gift - even when you're ballin' on a strict budget! For the jewelry lover - I included two of my very favorite pieces that I wear on a weekly basis. This monogram necklace is an absolute classic, and it also comes in silver. You can wear it with everything and it's appropriate for all ages. If you have a die hard jewelry junkie on your list, these beautiful taupe/blush tassel statement earrings are a must-have. They're lightweight and bump every outfit up a notch! For the gal who loves to be cozy - I included the cutest fuzzy earmuffs that are UNDER $10! The headband has the cutest pearl detail and you seriously can't beat that price. And, because I am obsessed with slippers of all kinds, I had to include a super glam sequin slipper and a classic pink fuzzy version. These will keep your toes toasty and they're also completely worthy of posting on the 'gram. For the super sassy girls - You can't go wrong with a pair of pink sunglasses! (Cue Miranda Lambert - unless you don't listen to her, in which case, what are you doing with your life?!) These sunglasses are fun, retro, and completely glam. If you know someone who likes to be extra, these will be her jam, but they won't break your bank account! For the beauty junkie - Oh, do I have some finds for the beauty lover on your list! First up is portable, lighted vanity mirror in a size that will let you take it anywhere. I use mine daily and I love it! If you know a gal who could use some organization in her life, I included a clear, acrylic organizer that will be a game changer. Everything is neatly put away, but still highly visible. Something every beauty junkie knows? The secret to good makeup starts with tools, so I also included an affordable but high quality brush set from EcoTools. I own several of their brushes and they are fabulous. The pink details make them extra sweet. And honestly, what true beauty addict doesn't want actual products? I gotcha covered. A neutral eyeshadow palette is always a winner and this one is gorgeous. I rounded it out with a super cute bath set from Soap and Glory. Their products are LEGIT. For the coffee connoisseur - If you love coffee or hot cocoa, you gotta have a super cute mug to drink it from. It's like, a rule of social media. Drinks were made to go in cute cups. This adorable mug from Target is so sweet and so inexpensive. You'll feel #instafamous when you drink from it, I promise. This would be perfect to pair with a Starbucks gift card and call it a day. You're welcome. Here are links to every item you see above! Please note they are affiliate links and while I may make a small commission, there is absolutely no extra cost to you. I really hope this gift guide is helpful! If you'd like to see other kinds of gift guides for different budgets or folks on your list, please let me know. I was thinking about doing a few more in different price points (maybe $50 and $100 and under) and I have one coming up specifically for my plus-size ladies who want to help the folks in their life know where and how to shop for them! Most importantly though, I want to deliver the content YOU want to see. Let me know what you're itching to find out about! Let's get jolly, y'all! Thanks, girlie! I'll wear anything if you add glitter. Haha! Beautiful picks. I really like the initial necklace ! Thank you so much! I have one and wear it all the time! These are all such great gift ideas!! I love the initial necklace! Hi y’all, I’m Jenny Taylor! I’m so glad you’re here. 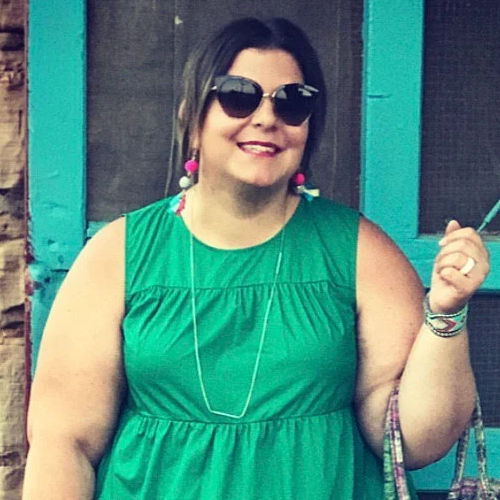 I’m a wife, mama, plus size blogger, Instagram junkie, jewelry hoarder, and lover of all things leopard. Welcome to Taylors and Tiaras, where we celebrate life and style at every size!